CLIA is the cruise liner industry’s largest trading association and over two thirds of all European cruise companies docking at Santorini are members. 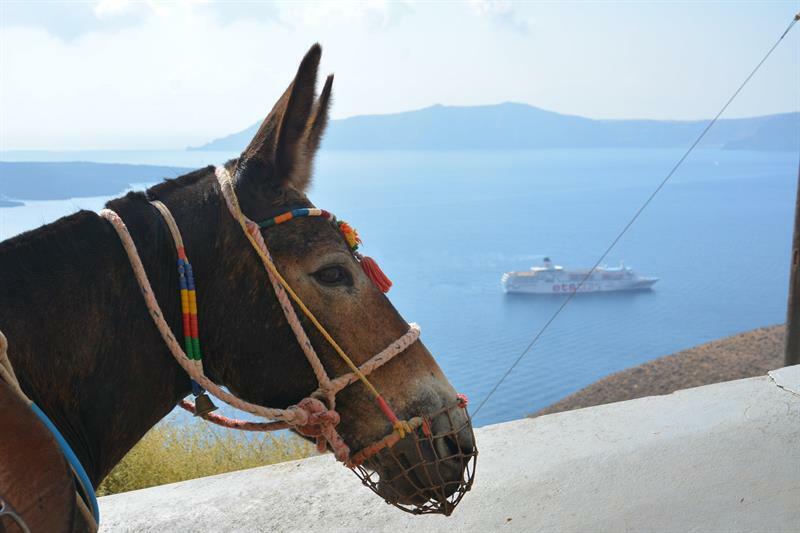 Cruise passengers will be able to see the In Their Hoovesvideo on board liners heading to Europe and supporting information leaflets will be readily available on board liners docking in Santorini. The Donkey Sanctuary has been working in partnership with Greek Animal Welfare Fund has been working in partnership with Greek Animal Welfare Fund (GAWF) and visiting Santorini to deliver joint equine outreach since 2000. More recently the charity has redoubled efforts to work alongside the Greek authorities to establish better working practices. During a welfare assessment trip in August 2018, Santorini’s mayor Anastasios-Nikolaos Zorzos made welfare commitments, including improved access to water and shade, particularly in the main tourist area of Fira.